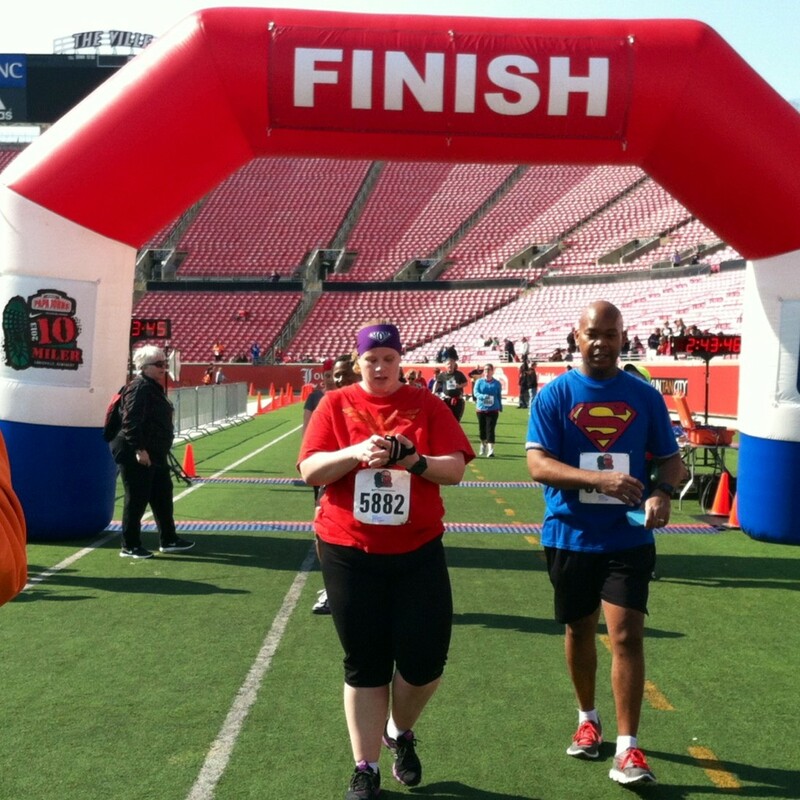 The Papa John's 10 Miler Write Up! 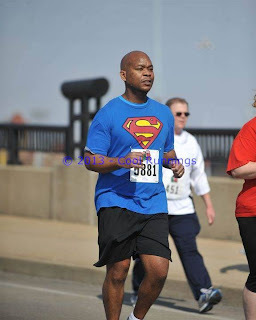 I had been ready to do the write-up for Damary and the Papa John’s 10 Miler, but then the tragedy in Boston happened, and considering I went to college and lived in Boston, it was a lot to take in. 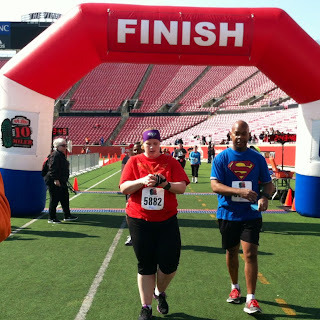 I also didn’t want to not finish what I had started in describing running the Louisville Triple Crown of Running for the first time with my wife. So race morning came and we had our routine down now. 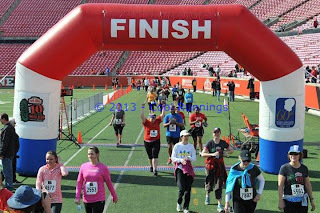 We headed out to Papa John’s Cardinal Stadium and got our parking and took our time heading to the bathroom and getting our place at the Starting Line. Along the way, my rockstar wife ran into some friends and we all talked to each other, not acknowledging and pre-race jitters we were all feeling. Then, just like that it was time to start. This course and race would not only prove to be Damary’s longest road race, but it is EASILY the hardest terrain she would be facing (i.e. elevation, hills, etc.). I told her this to help her understand when she handles this race; she should be BEAMING with self-confidence going into her first Half marathon. It wasn’t false bravado either. Serious, even after dealing with about 4 miles of uphill of Iroquois Park, at mile 9.5 you have a 15% grade incline at the Denny Crum Overpass. As we started the race, we had decided our strategy would be half mile run, half mile fast walk. To get Damary ready for the Kentucky Derby Festival Half Marathon, because this was most likely what strategy she would employ when on her own. We held a great pace, and I must admit, for only being her 3rd trained-for race, I was impressed with her poise and race-level-maturity. As we went up the gradual uphill of Southern Parkway and into Iroquois Park, I could see the unsure look in Damary’s eyes because everyone she had talked to prior to the race, had her a little spooked about running Iroquois Park and how difficult it would be. I kept telling her, she owned this and everything happens one step at a time. So we were in the heart of Iroquois and my job was to keep her morale up as well as be honest and let her know how well she was doing in handling the hills and elevation. As we made that last climb and turn to start the decline, I looked over waiting for her to realize that she had conquered it. That smile was priceless. She realized she had sleighed the dragon. If you have EVER trained for something, sometime during the competition phase you realize you just handled something that you had feared…THAT is sleighing the dragon. I was proud of her, but more importantly, she was proud and had confidence in herself. That was AMAZING unto itself. Now it was the home stretch….with only one difficult part of the race left. Denny Crum overpass…it is a 15% grade overpass at mile 9.5 of this 10 Mile race. I told her, that I would never interfere with her racing, but she would thank me for it later, but to run up the incline part of the overpass. It would be rough, but if she ran it, she would feel a sense of accomplishment. If she didn’t, it would always bother her in the back of her head. In the 2 previous Triple Crowns I have run, I have always run it because I knew if I didn’t I would hate myself for feeling like I gave up. She handled it and it was great. 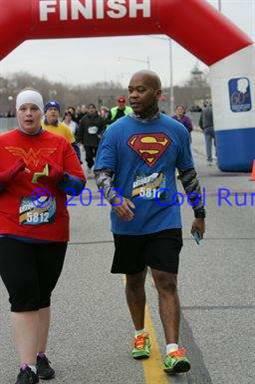 As we came up to the stadium where the football players come in, I was getting her pumped up and ready for her finish! So here we came into the finish, and I videotaped and took pictures of it. I will admit, I was a little sad. We had run the last leg of the Triple Crown….our first set of races together. This was a special moment to me and I wanted to savor every single second I could. So we crossed the finish line and I was so damn proud of Damary! 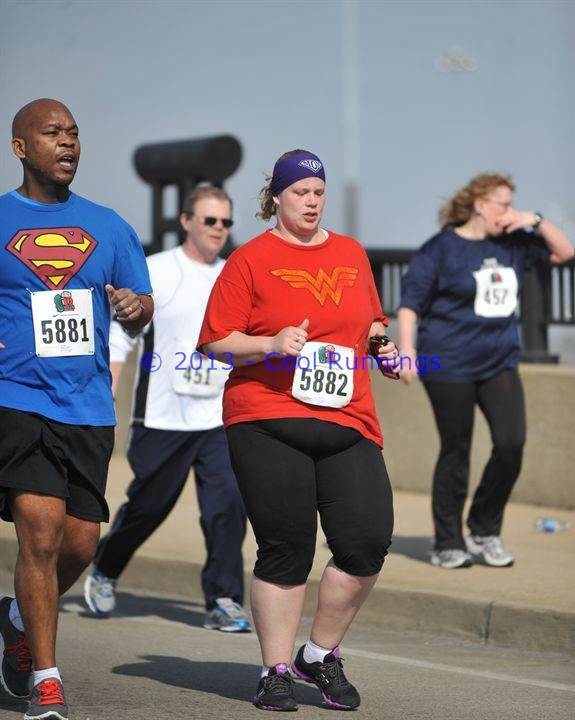 I truly know that she is ready for this Saturday’s Derby Festival Half Marathon. I cannot wait to be at the Finish Line with our daughters cheering her on. She has been to almost 40 different Finish Lines supporting and cheering me on, I cannot wait until I get the chance to put the spotlight strictly on her. And what makes my heart even more proud? 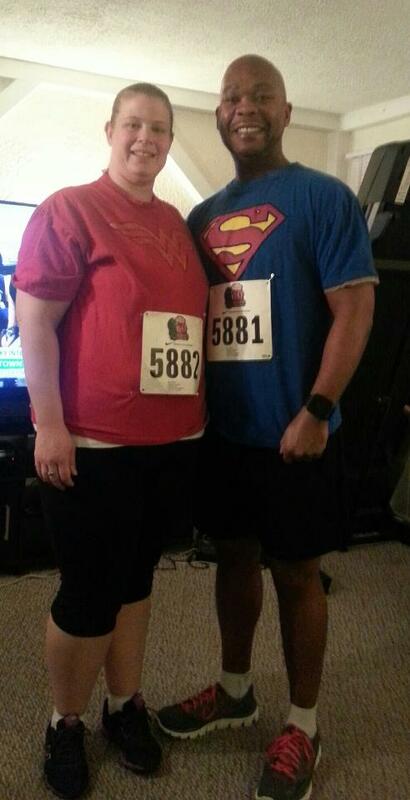 We’re already registered to run a Half Marathon together in the fall J Next time I write, and I promise not to wait so long, it will be (hopefully) have my wife guest starring, taking about her FIRST EVER HALF MARATHON!! SO proud of both of you, as always! I cant wait to see how Damary does this weekend, I still remember my first half-marathon, amazing feeling!!!!! sO PROUD OF THE BOTH OF YOU!!!! cant wait for a recap!